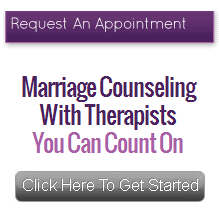 On our FAQ page you'll find answers to frequently asked questions about couples therapy. What does couples therapy cost? The fees range from $145 – $250 per 50-minute session, depending upon the therapist’s license and years of experience. Do you have a sliding scale for fees? We don’t have a sliding scale, but sometimes we have one intern who charges less. Check “Meet the Marriage Counselors” to see if there is currently an intern on staff. If our costs for therapy are too high for your budget, we encourage you to try our self-development resources. Click Couples Resources. You can also find low fee therapists at your county’s Family Service or Mental Health Departments. They are listed in the front of your telephone book by county, or you can search online. Many of our clients submit their statements to their insurance companies for reimbursement. While our billing statements comply with insurance requirements to facilitate your reimbursement, we are not affiliated with any HMOs or PPOs and we do not accept payments from insurance companies. We recommend that you check with your insurance company to see what services your policy covers. How long will we need to come? The duration of treatment depends on how long the pattern has been in place, your motivation and your goals. Some couples come for just a few visits for a tune up, while others make a long-term effort. A complimentary telephone consultation with one of our therapists can help answer this question specific to your situation. Contact us and we will help you arrange one. Should I see a man or a woman? You might have a preference for working with a man or with a woman, but in fact, male and female therapists are equally prepared to deal with the problems confronting you. If you are unsure, you may request a complimentary telephone consultation with one of our male and one of our female therapists, to see whether you feel more comfortable with either of them. Contact us and we will help you schedule it. What is a Couples Institute associate’s level of training? Therapists who work at The Couples Institute have done training with one or both of its founders, Dr. Ellyn Bader and Dr. Peter Pearson. They have also completed post-graduate degrees and they have completed licensing requirements for their specific type of license to practice therapy. What is the meaning of a Couples Institute Certificate? A therapist who completes twelve months in the training program, “Developmental Model of Couples Therapy: Integrating Attachment Theory, Differentiation Theory and Neuroscience,” receives a certificate for display. This certificate shows that a professional has completed 36 hours of study over 12 months. A therapist who completes three years in the Advanced Program receives an advanced certificate. This certificate shows that he or she has completed another 36 hours of study over three years. Certification applies solely to that educational process. The Couples Institute cannot endorse the performance of that therapist and is not responsible for the professional conduct of those who earn certification status. Our main office is in Menlo Park, and our therapists practice all along the peninsula. They are located from San Jose up to San Francisco. On the horizontal navigation bar, hover over “Meet the Counselors,” and the drop down menu will show you your selection of locations. Our therapists work different hours. Some of them are available for evening or weekend appointments as well. If you are in need of a specific time of the day, our office can let you know which therapists on our staff can see you. Call our office at 650-327-5915 or click contact us. There you’ll find a contact form with room for additional notes so you can let us know. The quickest ways for you to get started are 1) complete the “contact us” form or 2) call our office at 650-327-5915. Then we’ll arrange for one of the therapists to contact you. Our therapists do their own scheduling, so you can set an appointment with them on the phone at that time. All consultations and records are confidential. We do not email, fax or transmit health information by any electronic mode. Further, no one will be advised of your participation in counseling unless you specifically request it, in writing. The law provides certain exclusions for confidentiality in cases of child abuse, adult or domestic abuse, health oversight, judicial or administrative proceedings, threat to health or safety, and worker's compensation.